So you’ve moved into a new place and you have nothing, nada, zilch, by way of cleaning products. Or, over the years, you’ve managed to assemble a motley crew of cleaning products that you don’t actually need — like a bottle of granite cleanser when you live in a home with butcher block kitchen countertops? — and want to start fresh. 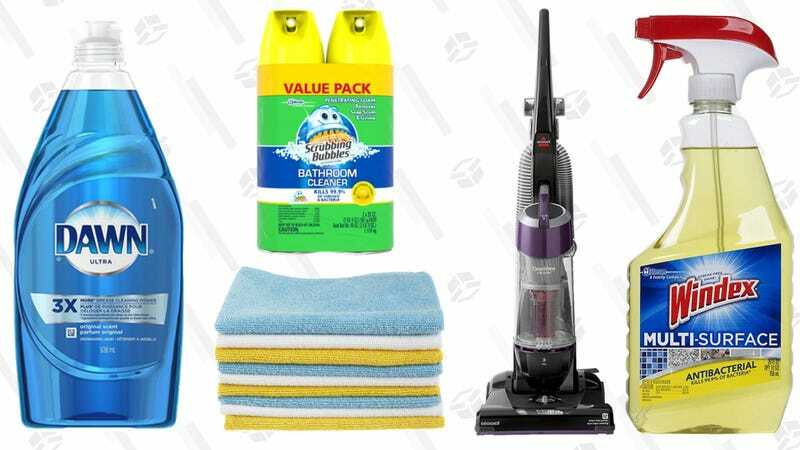 These are the five most essential cleaning products and tools you need to keep virtually everything in your home super clean. Jolie Kerr is a cleaning expert, advice columnist and the host of the podcast “Ask a Clean Person.” Each week, she’ll round up five essential cleaning products, tools and organizational systems to help you live your tidiest lives. Do you need product recs? Email Jolie or tweet at her with requests or questions! 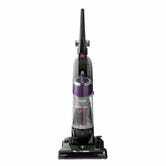 A vacuum is pretty much non-negotiable — oh sure, you could try to get around the purchase by going for a broom and dustpan combo and a small handheld vac, but don’t cut that corner and here’s why: Inexpensive, lightweight vacuums are easy to come by, and for close to the amount you’ll spend on that broom, dustpan and handheld vac, you can have an upright vacuum that will much better serve your needs. A stick-style vacuum is perfect for people with limited storage space, and because it’s lightweight it’s also easier to use on the regular for keeping floors, furniture and window coverings free of dust, dirt and hair. This stuff is such a damned joy to use, seriously. Who says that about a cleaning product?!? A LOT OF PEOPLE ACTUALLY. Because Scrubbing Bubbles seriously are a joy to use — especially if you use them the right way. But let’s back up so I can tell you what Scrubbing Bubbles does and why it’s such a miracle product: It’s a foaming bathroom cleaner that you spray in the shower/tub, sink and toilet. 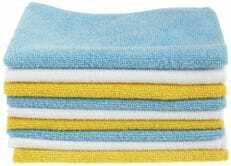 Allow it to sit for 5-10 minutes (this is the part where using it the right way will make all the difference) and when the color of the foam changes from blue to white, wipe it away with a microfiber cloth or a sponge. Note: Scrubbing Bubbles can cause discoloration on plastic, so spot test it on the toilet seat before use to ensure it won’t cause damage. The thing about all-purpose cleaners is that they’re not truly all-purpose, but they come pretty close. And while there are many great all-purpose cleaners out there — Formula 409, the Method brand products, Fabuloso — most of them can’t also double as glass cleaner. 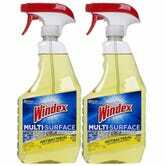 But the Windex Multi-Surface stuff can, which eliminates the need for a separate glass cleaner; one way to make cleaning much, much faster is to cut down on the number of products in your arsenal, opting for multi-taskers rather than single-use products. Generally speaking, lower cost dish soaps are lower cost because they contain more water than their spendier counterparts, which means you’ll have to use more of it to actually get your dishes clean. Dish soap has a great many uses beyond dish-doing. It can be diluted and used as a floor-mopping solution; pressed into service for stain removal from clothing, furniture and household textiles like carpet and bedding; and even mixed with cider vinegar to make an excellent trap for fruit flies. Microfiber is just incredible for cleaning purposes. The cloths can be used dry to remove streaks and fingerprints from stainless steel, or to dust all kinds of surfaces from electronics (TVs, laptops) to furniture, baseboards and window sills. When used wet, in concert with all-purpose cleaner or foaming bathroom cleaner, it will make quick work of scrubbing everything from countertops, to sinks and tubs, to floors. They’re also inexpensive and reusable; simply launder them and they’ll be ready for the next job. Just one quick note on washing them: Don’t use fabric softener or chlorine bleach on them!